The VWR 1226 Water Bath comes from a long line of trusted lab products. The sleek design of this easy to use lab water bath makes it a must on everyone’s used lab equipment list. 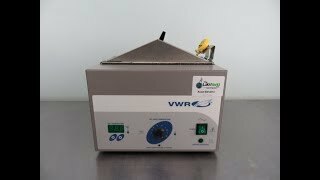 The VWR 1226 Water Bath has a 6 liter capacity and microprocessor Temperature controller with LED Display. The water bath chamber 11.5 x 5.9 x 6 inches and built with stainless steel ensuring long term use. The 1226 Water Bath by VWR has a temperature range of ambient to 99.9° Celsius and is outfitted 115V power. The line is shielded an internally wired to the water bath to guarantee safety. The digital controls on the front of the VWR 1226 are extremely easy to use and toggle between. This six liter water bath is durable enough to stand the test of time. The VWR 1226 Water Bath has been tested and reached its temperatures without issue. All of our lab equipment comes backed with our standard warranty. Should you have any questions, please don't hesitate to contact us.